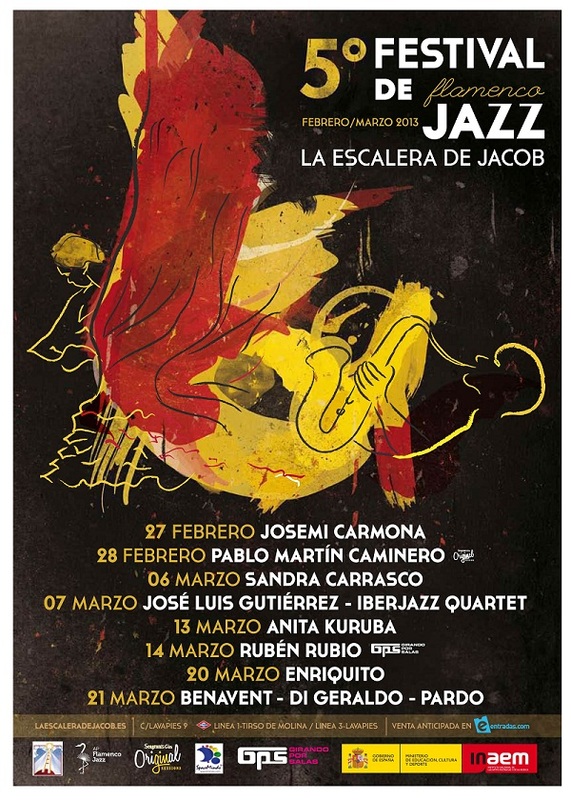 All concerts take place at La Cueva de la Escalera de Jacob in Lavapiés from 27 February to 21 March at 9:30 pm. La escalera de Jacob, Lavapiés 9, Madrid. Metro: Tirso de Molina and Lavapiés. One of the Key Figures in Contemporary music in Spain, and, according to Paco Lucia, the best guitarist of his generation,Josemi Carmona explores the rich colorful palette of new possibilities for flamenco that is bound with jazz, salsa and bossa nova. His first solo project “Las Pequeñas Cosas”, recorded by Universal Music Spain, was given a Latin Grammy in 2011 as the Best Flamenco Album. The Pablo Martin Quintet album “El caminero” was the winner of the best album in 2011, the award was recently presented by the BBK Foundation. In the festival the quintet continues to explore the thrilling relationship between flamenco and jazz, a field where there is still so much to discover. Having conquered around 15 stages in different countries on different continents within last year and worked together with great international artists like Anoushka Shankar and Avishai Cohen, the travells of this young artist, especially known for her extraordinary voice, will finally bring her to the stage of La Escalera de Jacob to give a concert that includes both,unreleased tracks form her latest album, plus pieces in collaboration with Melón Jiménez. Jose Luis Gutierrez, one of the most international Spanish jazz musicians, a brilliant saxophonist and composer, is not just a musician; he is one of these personalities where classifying him becomes really difficult.Exploring other cultures and far off lands, his originality and strong personality make his music as a perfect combination of different ingredients and creative improvisation, followed by an enthralling explosion of tastes,especially for the elusive and indescribable smack of “something” in his music. One of the most important characteristics of his creation is the influence of Iberian music, giving way to the rise of truly original and passionate Iber-jazz. His first album “Núcleo” was considered the best jazz album of 2004 in Spain. His last album “The Fruit Salad”, released in 2012, goes even further in discovering the fascinating possibilities between Iberian music and jazz. Anita Kuruba, the singer of Canteca de Macao, presents her first cycle entitled Women a collection of personal interpretations accompanied by flamenco guitar (GaizkaBaenaSolas) and trumpet (Enrique Rodriguez Enriquito). Between humor and the profound, Kuruba creates a trip that passes through different stages of a couples relationship where the female point of view, with all its delicious versions of the times, will become apparent. Rubén Rubio´s “Biondo” was named as the best album of 2011 edited by a national bass player. The quartet that moves between Jazz and Funk with a touch of Flamenco and Folk, will bring to the stage newly developed themes of “Biondo”, plus more personal versions of Jazz Standards.To add more excitement, Rubio was chosen as The National Bass Player 2011 in the international fair Bassday 2011 held in Madrid. The young, rising and very promising artist Enrique Rodríguez or Enriquito, presents his first album Me quito el Sombrero or I Take My Hat Off, an original work without precedents where the trumpet and flugel horn take the stage with flamenco themes winding around jazz improvisations. Enriquito has collaborated with many well-known artists like Carles Benavent, Antonio Serrano, Juan Diego de Jerez, also Jorge Pardo, whose music has been a great inspiration to him. This trio rose as a continuation out of a former group of Jorge Pardo and Carles Benavent, a sextet that made history in new flamenco and toured the most important jazz festivals from Vitoria to Montreal. With the arrival of Di Geraldo this excellent trio was formed, consisting of three authentic fusion masters of flamenco and jazz, whose album “Sin Precedentes” was awarded as the best jazz album in 2010 at the Music Awards XIV Edition.